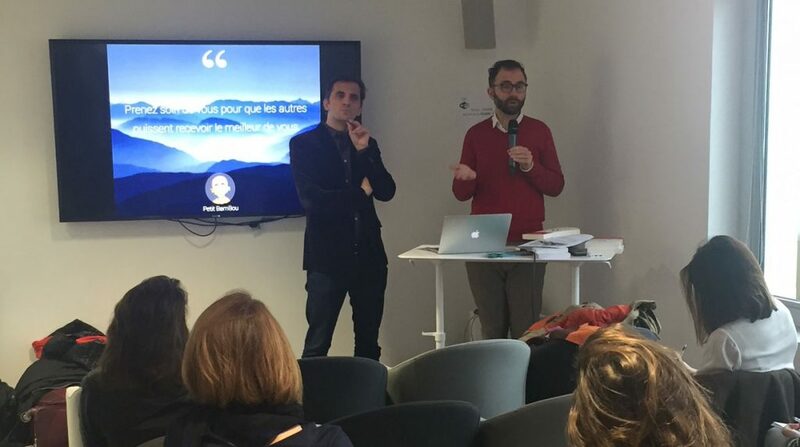 Benjamin Blasco, cofounder of the meditation app Petit BamBou, and Sébastien Henry, a pioneer for corporate meditation in France and author of 5 books on the subject, shared their experience and insight about the benefits of integrating wisdom and meditation into your business. “Five years ago, I was a world-class “multi-tasking” expert. I was skyping, emailing and texting simultaneously, working all the time, running from one place to another. I felt extremely efficient. But then I began to see that this special ability was not as great as I thought: in fact, switching from one task to another was not really efficient. I realized that I was never 100 % focused on what I was doing, both in my private and professional life. Work issues were constantly in the back of my mind, whether I was with my children, brushing my teeth, with friends… I had the feeling that I was not fully living in the moment. I felt that my life was moving forward without me. All these questions led me to practice meditation. Soon, by looking deeper into myself, I reconciled myself with my body, my emotions and my stress. I was working hard for PayPal based in Luxemburg and began to wonder why I was working so hard. Perhaps it was because of my ego. I talked to a good friend who had opened a Facebook page called Petit BamBou in 2012 focusing on altruism and freedom, with a large number of followers. I began to become more attentive to others and I realized that there were a lot of people suffering from burn-out. I wondered how I could help them. I left my job and co-founded Petit BamBou in 2014, with the objective of helping people to discover meditation via an app. Users had 8 free sessions and the option to register. The app to help people practice meditation was launched in 2015. It was self-financed and grew very quickly. - The impact of your ego on your decision-making: your ego drives a lot of your decisions. Because of our ego, we tend to give our opinion even if we are not qualified to give it. At Petit BamBou, we try to ensure that our ego plays a minimal role. - Using automatization to increase efficiency. We try to introduce more humanity and compassion into our daily work. We write emails that are more caring, add a bit of humour, talk to our clients and colleagues with a compassionate tone. There is a story behind each one of our 1.4 million users: we try to speak to each of them, by tapping into their uniqueness, taking into account their age, their profession… We have between 3,000 to 4,000 users a day and we do our best to treat them as if they were our first users. - Because we are user-funded, we are lucky enough to be financially independent. As a result, we have more freedom and don’t have a business plan or deadlines. Our users are looking for quality service, not better results. - Deadlines: we do things when we are ready and not because of an arbitrary deadline. We are user-driven; our goal is not to generate more sales but to help people to practice meditation. We want more and more people to be happy. - Values: quite often, values are replicated from one group to another. We have our own values, they are within us: gratitude, confidence, fun, execution capacity. These are our true values. How does your meditation experience impact how you set targets? We don’t set. We are lucky to have rapidly achieved financial independence. Our users are our only concern. We don’t want to expand faster, we don’t take any decisions unless we are completely ready. There is no pressure at Petit BamBou, our teams are relaxed and fulfilled. You seem very detached, but you still need to pay your 9 employees at the end of the month…. We could have decided to hire more people to grow faster but we didn’t. We only recruit people who are in line with our culture. Our business model is reasonable, but, once again, we are lucky enough to be self-funded. Do you have a strategy to transform your app users into buyers? There are no discounts or special offers at Petit BamBou. We believe that meditation should come from the user’s own desire and not due to some external incentive like cheaper cost. What are your projects and ambitions for the future? We have plenty. Above all, we want to be fair regarding meditation practice. We feel that some of our app users want to go further so we try to foster this desire by proposing some training. We want more and more people to meditate. Today, Petit BamBou is only available in French but we plan to launch an app in Spanish and German to meet growing demand. Petit BamBou will grow but not too fast. We will continue to use our internal resources. What was your starting fund? We started with 10,000 euros and didn’t pay ourselves a salary for one year. With no deadlines, how are you organized in terms of internal meetings? We have one 30-minute meeting a week. But there are only 10 of us at Petit BamBou! “I am going to focus on the practical aspect of “meaningful growth”, to explain what we can do on a daily basis, based on my personal and professional experience. I worked in Asia for 9 years and growing fast was at the heart of our priorities. We worked very hard to reach our target of doubling our sales every year. “Growth with meaning” was one of our corporate values, and once a year, we exchanged with the rest of the team on the subject of meaning, but it wasn’t enough. I realized that putting meaning into growth requires daily care. And I wasn’t doing this, even though I had begun to meditate in 2000. I understood that it was going to become part of my daily life. I came into contact with the inner peace I was looking for. I understood that this peace was at my fingertips and that it only depended on me. So, I practiced meditation in Asia for years on a daily basis and came to understand that these daily encounters with myself brought me greater meaning than the annual meetings with my associates. During the meditation sessions, I felt that I was growing as a person. Through meditation, I managed to give 100 % of my attention to others, I was really present for those around me. I also realized that there were more and more moments when I would feel closer to the most beautiful part of myself. I felt more creative, I had more empathy, I felt more powerful to inspire others and not to crush people. I also felt that when I was in contact with the most beautiful part of myself, it would help others around me to do the same, like a natural diffusion. This is a path of life, and I know that this path is not over yet. Every Monday, I help people who have come to the end of their lives and I receive so much in return from them. A few years ago, I was too busy to appreciate this wealth. It is so enriching to spend some of your time helping these people. - Kindness meditation or fraternity training: how can we become more fraternal? It’s a practice which helps you to be nicer to others, people you know but also people you don’t or even dislike. - Limits acceptance: when you have set high targets and you don’t achieve them, accept it. You should be aware of your limits. Your objectives won’t disappear, but you need to accept them. It works and it is very simple. Breathe in: I see my limits / Breathe out: I accept them. All these training programs take 30 minutes per day. This discipline brings me a lot of happiness. Another satisfaction is my “sangha business” with top managers. Since I started working with them, I have seen the desire for commitment growing within them. To do more for others, for their team, for the forgotten ones. In conclusion, I would say that what took up most of my time was commitment. For my last book, my editor did not want to use this word for a title and he chose “Ensemble” (Together), “Act for yourself and for others”. All these wisdom practices will bring more meaning to your life and are also a source of commitment to others. They nourish the desire to commit to others. This is what I share in my book. Can you talk a little about Tania Singer’s work? She designed a protocol with many subjects and she asked them to practice mindfulness followed by training on fraternity. Other groups worked only on mindfulness. She demonstrated that mindfulness without any specific goodwill training is less propitious to creating caring behaviour towards others. She also proved that from a cerebral point of view, compassion differs a lot from empathy: she showed a picture of someone suffering and asked volunteers to send a goodwill message to this person; then she asked other volunteers to feel his pain. She proved that there were two distinct cerebral areas and that goodwill was associated with a feeling of well-being. Regular training develops the cerebral areas linked to goodwill and hence favors pro-social behaviour: the more you work on fraternity, the more your brain shapes itself and you get a chance to act with more goodwill. We see more and more venues in Paris for practicing meditation: do you believe that meditation will become a key practice in companies, similar to the team building phenomena? It’s true that in countries such as the United States or in Asia, mediation is a lot more common. We see that it is becoming more and more prevalent in the same way as hygiene or sport. Meditation could take a larger place in people’s daily life, similar to running. I often compare it with brushing your teeth. Can you explain the practice of listening to the wisdom path? There are many methods, but I will explain to you how I practice and share it with others. Years ago, I did a 12-day course on “listening to your intuition” and it really transformed me. It is not only instinct that we don’t take the time to listen to. Instinct is more like an animal and reflex reaction, that occurs in a dangerous situation, for example. The “voice of wisdom” is like a little voice which is always present but that we never listen to because our mind is too much agitated. The practice I use the most is a meditation session, next I imagine that I am in a place of imaginary plenitude where I feel in harmony with myself. And then you feel that you connect with this little voice. When you are confronted with a difficult situation, you listen to it and know that you are making the right decision. Thank you Benjamin and Sébastien for your testimony!